Sue wants to change the system to be responsive to the goals of the grantor. Her intention is to educate people about how they can choose a model of trust that works with their family and assets. Once you become aware of how broken the system is, you'll be motivated to take an interest in how your assets are being handled. Educate yourself by learning a few simple things that you can do to maintain control of your money. Communicate with your heirs about the details of a trust or will. Ensure there is accountability in a trust by requiring an accounting and written report of a fiduciary annually. Don't grant broad authority to your trustee. Granting control and authority over your family to a trustee is an invitation for abuse. Establish a standard of performance for investments for a trustee to meet. Empower your beneficiaries so that the people who are affected by the instrument you have created are given the authority and power to remove a bad trustee. Anticipate events and what you'll do if you cannot speak for yourself due to disability. 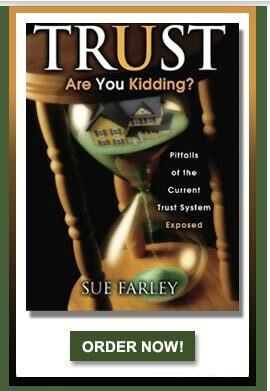 Sue Farley has over thirty years handling litigation surrounding trust cases. She graduated from UC Hastings College of the Law and after five years of trial work for major San Francisco law firms, moved to a smaller firm where she was lead counsel in major litigation. She devoted seven years researching the entire life cycle of the trust from its creation, through administration, to its conclusion. Her company, Fiduciaries Technology Incorporated, is dedicated to bringing her solutions to the general public.